The Brunel SP600M is a heavyweight industrial metallurgical microscope built to a very exacting standard, and is available as a brightfield instrument (SP600M) or as a brightfield/darkfield microscope (SP600BD) . A particular feature of this model is the magnificent dual action mechanical stage. This is large enough to accommodate the largest of specimen surfaces, and measures 280 x 270mm with a movement range of 204 x 204mm. Movement can be via a rapid and very smooth gliding system controlled by a simple drop down handle. 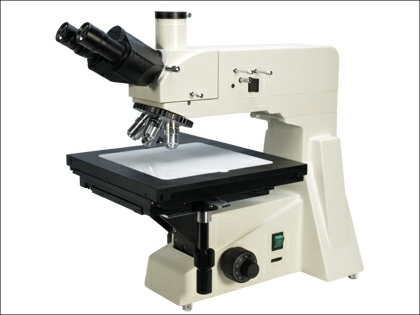 This allows very rapid screening of a large specimen. In addition the stage has a conventional rack and pinion movement that is controlled by the usual drop down mechanism. 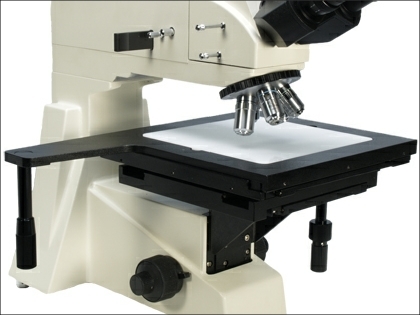 This is an ideal microscope for the screening and high power examination of circuit boards and electronic components of all types. The SP600BD can toggle between brightfield and darkfield illumination that allows the visualisation of subtle variations in surface structures. Focus is obtained by the vertical movement of the stage via low position coaxial coarse and fine focus controls. The stage platform measures 300 x 300mm with a central contrast insert that can be black or white. The gliding mechanism allows movement of 204 x 204mm and the rack and pinion 153 x 153mm. Quintuple nosepiece with plan objectives corrected for use without coverslips. Both models are equipped with a polarisation option with the ability to mechanically cross the filters. Both have field and aperature diaphragms allowing Kohler illumination. The SP600M has a 6v 30watt halogen light source and the SP600BD 12v 50watt. Coaxial coarse and fine focus mechanism with tension adjustment and focus stop and a filter set wheel. The SP600M series has a range of accessories available from our online shop.